Large objects often pose a problem while packaging. They are bulky, and difficult to handle, and require more robust seals to ensure safety. All of these problems are addressed in the Extra Long Table Top Poly Bag Sealer. With this product, you can simplify the process of packing bigger, bulkier items with ease and speed. Famous for providing only high quality products, we can ensure that you will only receive the best value for your money. 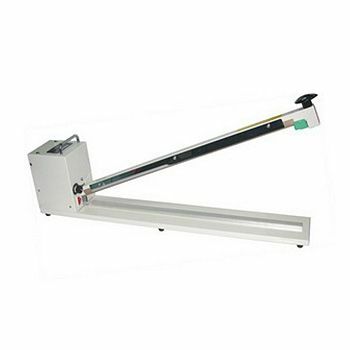 The extra long table top poly bag sealer allows the user to seal large objects on the table top. It is the next stage of sealing and packaging and offers great sealing and packaging quality for any product. The sealer comes with a round element wire, which is used for trimming and sealing. There is also a sealing timer along with a carrying handle, so that you can carry it around with you. This sealer has been made from sturdy steel and has lightweight construction to make it portable.